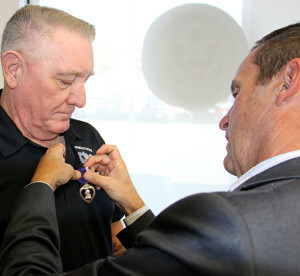 Rep. Steve Knight, R-Calif., pins the Purple Heart on Master Sgt. Robert Mahoney. PALMDALE, Calif.–After Vietnam War service as a Seabee (Naval Construction Battalions), and Army duty as a paratrooper and Green Beret, it would have been a good time to call it a day for Master Sgt. Robert Mahoney. After all, he was a couple of years past his 50th birthday. Then, the Iraq War happened. His wife issued an order, the kind that lets even a Green Beret master sergeant know who is in charge. His son, John, was going to be deployed to Iraq. So long as his son was headed to Iraq, the elder soldier in the family better be going, too, Mrs. Mahoney ordained. Mahoney wears his hair in a crew-cut and looks he would pop up in the John Wayne classic about Vietnam, “The Green Berets.” So, no surprise that one of his nicknames is “Big Duke,” and he has a passing resemblance to “The Duke.” But Mahoney did his soldiering in life. He’s been in warrior harness for a while, through two hot wars, and some brushfire conflicts in different spots of the globe. 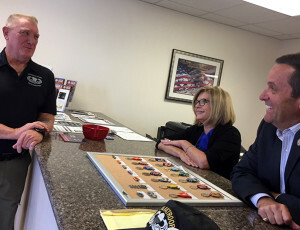 It’s been one of Knight’s favorite tasks during his two terms as a congressman to assist veterans in securing military decorations that were authorized, but could use a little bit of additional ceremony. Master Sgt. Robert Mahoney (right) is shown with Rep. Steven Knight, R-Calif., and Knight’s field aide, Cathy Rough. The Knight field staff searches out the paperwork and authorizations. They find the medals, and that becomes its own small Veterans Day ceremony, and it doesn’t even have to be Veterans Day. Knight will be succeeded in the 25th Congressional District of California by Democrat Katie Hill, but until then he will continue working with veterans, and as an Army veteran of the Cold War, will continue to work on their behalf. Mahoney was one of the veterans that Knight’s field representative, Christine Ward, researched. As the senior NCO’s medals arrived, another field aide, Cathy Rough, worked on arranging them in proper order on a display board. Reservist Master Sgt. 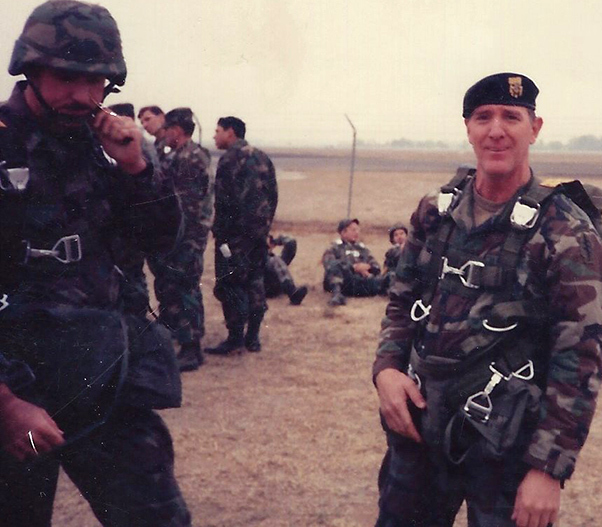 John Mahoney was finishing up a tour with Special Forces in the Philippines and thinking about “hanging it up,” retiring after a military career that spanned three decades, two branches of service, and several different elite units. All that, in addition to serving on the Los Angeles County Sheriff’s Department. But he did find time in a busy schedule to deploy during the Iraq War — twice. Mahoney looks younger than his 68 years, but this is a good time to not have to worry about landing on a reserve parachute. Although that has also happened in the lengthy career. He recalled that the Thai special forces troopers packed their own chutes on the ground, and when the canopies popped you could watch the dust and twigs fly out of the panels. So Knight, joined by staff members Mitchell Chase, Rough and Ward joined forces to put together Mahoney’s medals based on his military records. An impressive collection of medals earned over several decades. Over that several decades of service, there were awards of merit from the Reserves, and service medals from the Navy, and the Vietnam service medals. Mahoney must be a pretty fair shot. He had ‘Expert’ qualification badges for pistol and rifle. As Special Forces, parachutist badge, sure. “I went to jump school when I was 40,” he shared. “Did you have a nickname in jump school?” Knight asked. So, more medals on the board. 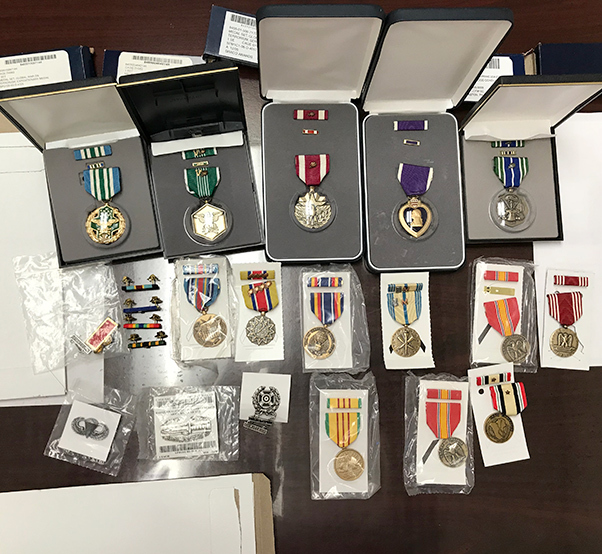 Some of the ones higher up the stack (of which there were so many they had to be pinned to a cork board) included two awards of the Meritorious Service Medal. That one usually goes to an officer, or a very senior NCO. There were several awards of the Commendation Medal, with a “V” clasp for valor, meaning earned in combat. Also, a Combat Action Badge. Both father and son were exposed to the extreme hazard of service in the Iraq War, with the elder Mahoney wounded, and awarded the Purple Heart. The Post 9/11 wars ushered in a renewed phenomenon of numbers of fathers and sons serving in the same war. Army Gen. Raymond Odierno, and his son, Capt. Anthony Odierno, served in the Iraq war, the son sustaining a catastrophic wound. Gen. John Kelly (now White House Chief of Staff), and his son, 1st Lt. Robert Kelly, both served in Afghanistan, with the younger Kelly killed Nov. 9, 2010. With so many medals on the board, it took a while to decide how to do the pinning. Finally, Knight, himself an Army veteran of Cold War Europe, decided. He picked the Purple Heart, the medal awarded for being wounded in action against an enemy. “That will do just fine,” Master Sgt. Mahoney said, standing at attention. With enough medals to fill a cork board, with the soldier and son returned from the Post 9/11 combat zones, maybe it might be the time to re-consider retirement. Master Sgt. Mahoney looked wistfully at the medals as they had been arranged by Knight’s staff. “There’s a few stories there,” he said.